With over 200 new features, Drupal 8 is officially here! Drupal is one of the world’s favorite open source content management platform.. and it just got even better. Here are some of the ways that Drupal 8 will benefit various groups of people. Configuration management – In prior versions of Drupal, most of the configuration was stored in the database. The problem with this is that it is very difficult to keep track of versions of the configuration when it changes. The only way to get configuration out of the database was to use a combination of modules such as strongarm and features to export things from the database into code. This was often time-consuming and error prone. Now with Drupal 8, configuration management is built-in so that carrying over configuration from development to production is a breeze. Web services – Drupal 8 can now be used as a data source to output content as structured data such as XML or JSON. This means that Drupal 8 can strictly be used as a back-end while the front-end could be developed completely separate with a framework such as AngularJS or Ember. In other words “Headless Drupal” capabilities are now built-in instead of requiring various addon modules and lots of custom development. 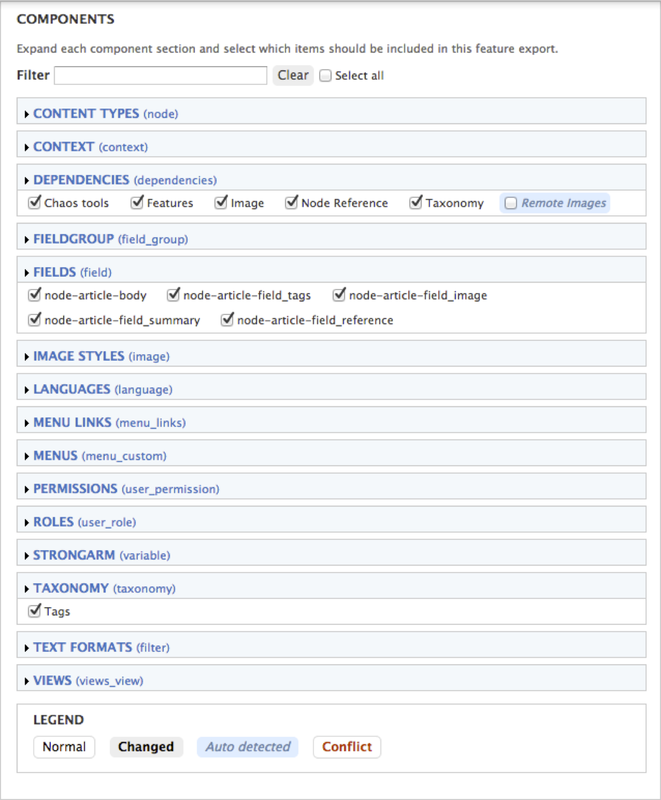 Bundled WYSIWYG editor – Drupal 8 is the first version of Drupal to come with a bundled WYSIWYG editor. Previously it was possible to add one of many different editors into Drupal but the setup was often time consuming and confusing. Additionally there were so many choices that some users felt lost about which one to choose. Over time CKEditor has become the most popular WYSIWYG editor for Drupal and now it is included out of the box. Mobile First – Previous versions of Drupal allowed developers to create responsive themes. However some modules were not 100% compatible with responsive layouts. Now with Drupal 8 all themes are mobile first which means that all community modules will be compatible with responsive layouts. Additionally the default Drupal admin theme will be mobile friendly which should improve the experience for editors who want to author content from mobile devices. Accessibility and Languages – Drupal 8 now has extensive support for accessibility standards including the adoption of many WAI-ARIA practices. This will make content structures easier to understand for people with disabilities. In addition to the accessibility improvements Drupal 8 now has multi-lingual support included. Drupal 8 has the capability to reach more users than any previous version of Drupal. One of the biggest improvements in Drupal 8 is the new configuration management system. Config is now decoupled from code and the database. Unlike Drupal 6 and 7, developers no longer have to rely on the features module for moving configuration around. Most large Drupal sites, and some smaller ones, require per environment configuration. Prior to Drupal 8 this was usually achieved using a combination of hard coding config variables and features. Drupal 8 still allows users to put config variables in the settings.php file, but putting config in code feels like a backward step given D8 emphasis on separating concerns. When a developer needs to export the config for the site they run drush config-export --destination=/path/to/project/config/base. This exports all of the configuration to the specified path. To override the API endpoint for the dev environment, the developer would make the config change and then export just that piece of configuration. That can be done by runing drush config-get mymodule.endpoint > /path/to/project/config/dev/mymodule.endpoint.yml. Drupal 8 and drush don't allow you to import the 2 config sets at the same time, so we need to run 2 drush commands to import our config. drush config-import --source=/path/to/project/config/base && drush config-import --partial --source=/path/to/project/config/dev. The first command imports the base config and the second applies any per environment overrides. The --partial flag prevents drush deleting any missing config. In most cases this is ok, but watch out if you delete a view or block placement. Best practices are still emerging for managing configuration in Drupal 8. While I have this method working, I'm sure others have different approaches. Please leave a comment if you have an alternative method. Update 11-Mar-2016:Removed --partial from base import. This prevented old configuration being removed during updates. D8 Updates - CMI info updated! He's working through some pretty big architecture options, and the community has been awesome about stepping up and supporting this initiative - so huge thanks to you all for keeping so many balls in the air! Best thing for new people wanting to get involved is to check out the list of issues and pick up what you think you can do (see important places to help section) core mentoring office hours can help as well (Wed. noon-2pm EST)! Why configuration module over features module? I've been getting inquiries in IRC and in the issue queue about a module I blogged about a few days ago. The blog post I wrote may have seemed that the module we are working on is duplicating the features module and that we should instead work on the features module. I want to clarify our intentions. The configuration module isn't a replacement for features. The vision is that they could work together. Features currently serves two purposes, 1) to group configuration together to satisfy a certain use-case, and 2) the actual export and management of configuration into a "feature" module. Features module is an awesome module when using it for what it was built for, creating KIT compliant features. The reality is most people that use features probably haven't even read the KIT specification. Hypothetically, let's use the features concept with the concept of a bakery. Lets say a baker has a feature called "Birthday Cake". This "birthday cake" feature has several ingredients to make a birthday cake and one of those ingredients is called flour. The baker has another system that manages ingredients called configuration. Configuration manages the flour ingredient and makes sure it always stays the same type of flour. Flour can go in a lot of recipes, not just in birthday cakes, so this ingredient shouldn't be owned by birthday cakes, flour should be free to be in any food item without creating a dependency of needing to bake a birthday cake too. If the birthday cake feature managed the flour ingredient, the baker could never bake cookies with his "Cookies" feature, without also baking a "Birthday Cake". If flour is managed by the "Birthday Cake" feature and the baker decides to never bake birthday cakes again for his bakery, flour no longer exists, because you only have flour if you bake birthday cakes. If one of the ingredients that configuration is managing ever changes the meaning of flour to mean "spelt flour" rather than what it was, "white flour", the recipes (features) would need to be notified by the configuration system saying that flour is different now and your recipes are now different. This is how they work together. Ingredients shouldn't care what recipes use it, and recipes shouldn't manage and own individual ingredients exclusively. The ingredients need to be managed by a different system. Ingredients are configurations and recipes are features. Recipes use ingredients, and features could use configuration. This module simply takes the configuration part out of features, and provides a new workflow for managing configuration, more along the lines of what CMI is going to do in Drupal 8. The vision is the features module could evolve to use this module once this module matures over the coming months. When Drupal 8 comes out, features will need to evolve to not do configuration management any longer anyways, all this will be built into core. Drupal 8 will probably not be released for a while, if it follows the same development cycle as D7, hence the reason why this module was written, to incorporate Drupal 8 configuration management ideas in Drupal 7. Since Features, in a sense, already does configuration management, we used a lot of features module code to build this module. As CMI progresses and more code is committed for Drupal 8, it's possible that this module may start looking like a back port of CMI and less like a duplication of features module. Either way, features module will need to evolve eventually. Features module is a great module when using it for what is was built for, creating KIT compliant features. It's once you start to depart from it's intended use, that you begin to find its limits. A new way to manage configuration on your site. At ActiveLAMP, we have always been a big proponent for putting all configuration for the sites we work on into features. Much like everyone else in the Drupal community that uses features module, we figure out what configurations belong together, and create a feature to group these configurations together. Do these configurations together satisfy a certain use-case? Sure they do, for the particular site that we created it for, but for the most part, the feature really isn’t reusable on other sites unless we build another site that has the same exact requirements that this feature contains. In reality, we don’t really create reusable features that we can then use on other projects, because the projects we work on are just too different to be able to do this. Don’t get me wrong, I love the features module, but I have to admit that I’ve run into my share of issues using features module for configuration management and deployment. Fortunately others in the community have ran into these issues too and have released modules such as features override, features plumber, and Features Tools. Not to mention entire workflows have been created around how to use Features to manage configuration for deployment that don’t even come close to creating KIT compliant features. Features module is really being misused, it’s not being used to create features, it’s being used to manage configuration and deployment. Several weeks ago, after having multiple conversations with Alan Doucette (dragonwize), of Riot Games, this paradigm shift hit home for me. I had been using features module for configuration management and deployment so long, that I didn’t even think twice that I wasn’t using it for its intended purpose. I also realized that I had a tool belt full of work arounds to make features module kind of work for configuration management and deployment. There are a number of issues that you can run into using Features module for configuration management and deployment. In future blog posts I’ll elaborate on what specific issues we have run into. After my discussions with Alan I was tasked to create a module just like the features module, except without the features part of it. We still think the features idea is a great idea -- to have a group of configuration to satisfy a certain use-case -- but we don’t think features module should be the tool to export and manage configuration. Our vision is that features evolves into using this configuration module to group configurations into a feature, but not actually own the configuration in a "feature" module. Over the past few weeks I’ve been rewriting the features module without the features part of it. I’ve also taken a some concepts from the configuration management initiative, specifically the concept of the "activestore" and "datastore" architecture. This module is currently in a sandbox, as we’re hoping to get the namespace of an abandoned project. This module is definitely a work in progress, but we’re already using it on a couple production sites to work out the bugs and workflow. We want to get the community involved to hopefully push this module forward. If you want to checkout the module, you can download it from the sandbox for now (http://drupal.org/sandbox/tomfriedhof/1412412). Once we get the namespace we’ve requested, we’ll promote it to a full project. Try the module out, file issues, and help out. Alan and I will be giving a BoF at SandCamp this Saturday, for those of you in town. Come join us, and hear about our motivations for building this module, and give us feedback. I have been doing a lot of work related to easing the process of building a site from scratch on an individual machine and thus dabbling with configuration management and related topics. Since configuration management is one of the Drupal 8 key initiatives I figured I would share some thoughts I had on the outer fringes of the topic with more to come in the future. One area of Drupal that has always seemed a bit odd to me has been the installation process/system. The process can play a key part in configuration management across machines and made it impossibly to implement a basic environment system during installation without hacking core. To remedy this issue I believe the installation system can be much improved, simplified, and made much more consistent with the rest of Drupal which will in tern make it easy to implement my environment system in contrib or core. The installation system in Drupal 7 was re-factored/rewritten quite a bit and has thus been quite improved, but I think the direction of the installation system could be changed to make it much better. Currently the installer attempts to fake systems in core, like the cache, and actually duplicates a lot of code found elsewhere for module management and what not. Why not simply package a minimal database dump, similar to how the update tests used a Drupal 6 dump written in DBTNG, that can be installed to create an extremely minimal Drupal installation. At that point the installer can act like any other module and provide forms to complete the process. All modules in addition to the required modules can be installed through the standard process invoked from the modules page, but done in an automated fashion through the installer. The reasons why this approach is beneficial are: 1) install.inc and install.core.inc could be virtually removed, 2) profiles would no longer be "hackish" during the install phase (solve the current issues related to dependency resolution and what not being the same for modules and profiles), 3) hooks like hook_system_info_alter() would work properly for profiles and modules during early installation phases, and 4) remove race conditions in general caused by maintain two sets of the same code. In addition, my environment.module would work without hacking core. This concept is nothing new in the development world, but is something I feel would be a great candidate for Drupal 8. * Get the current environment. * The current environment: production, staging, or development. The above code allows for the environment to be configured in the settings.php file for a site. During installation a profile (or module) can perform different tasks or conditional code based on the environment. For example, generated users can have a simple password on a development machine and complex ones on production or staging machines. // Do cool stuff that only devs get to see. Another cool feature that I have a use-case for on a site I am working on and seems to generally be useful is to enable modules based on the environment. Instead of having to do that in hook_install() or related it makes sense to have a way to specify that in a .info file. The above code allows for the following. Having this type of functionality in core would hopefully encourage better development practices and seems like a great feature to have. I have a number of scripts in combination with drush make, and the above environment utility that allow me to build out a fully functional site on a new box with a single command. I plan to cleanup the scripts, document them, and provide them in a followup post. As always I would love to hear your thoughts on this subject.